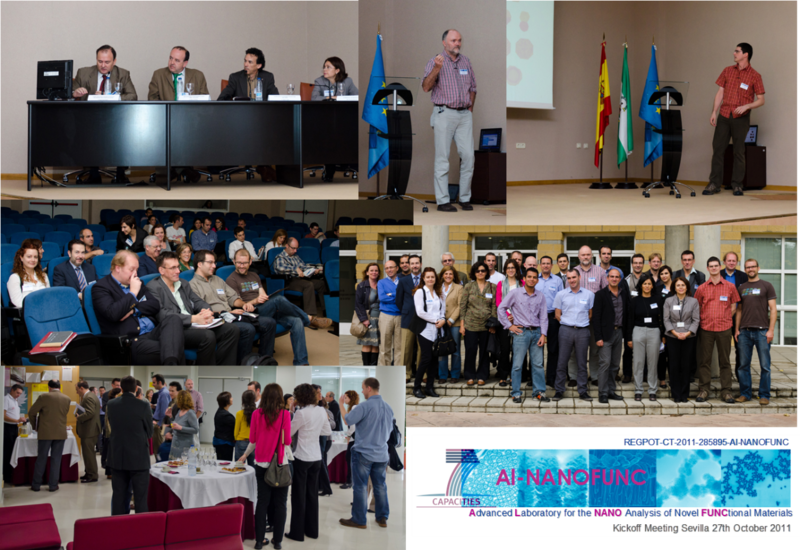 The kick-off meeting of Al-NanoFunc took place on October 27, 2011 at the Materials Science Institute of Seville, Spain. The meeting counted with the presence of representatives from the national and local authorities related to the project: Dr. Ceferino López Coordinator of the Materials Science Area at the CSIC, Dr. Miguel Angel Aguirre in representation of the General Directorate of Research, Technology and Enterprise of Junta de Andalucía as well as the director of the Materials Science Institute of Sevilla Dr. Alfonso Caballero Martinez and the project coordinator Dr. Asuncion Fernández. Also members of the network of collaborating centres, industry and academia participated with great enthusiasm in this meeting. Project coordinator, research manager and work package leaders introduced the project aims and objectives for the next years. The presentations from the members of the network of collaborating centres of excellence were the propitious starting point for start the discussion of future collaborations. After the kick-off a positive atmosphere of group of people willing to actively participate in this project stayed in the air.